The Board of Directors have been considering a statement supporting the freedom of expression at Quelab. This policy, very heavily based on the statement put out by the University of Chicago, and strongly supported by the Foundation For Individual Rights in Education (thefire.org), essentially says that Quelab won’t impinge on your First Amendment right to free speech, and won’t let others do that at Quelab either. You can find our draft of this statement on our Wiki. It asserts people’s right to free speech, as long as they’re not threatening or harassing others, or violating others privacy or confidentiality. All educational topics can be discussed at Quelab, and we do not want to stifle that creative and investigative spark. Please let the Board of Directors know your opinion on this proposed statement, and please give it a good reading and a dose of thought. The Quelab Board Of Directors Election is coming up. There will be a period of 3 days for people to vote, ending Wednesday February 17, 2016 at 8pm during our election celebration event. During the election period, all voting members will have a chance to submit their vote electronically. At the election event, before 8pm, anyone who hasn’t voted yet can submit a paper ballot. Nominations – Beginning now, any member can submit a nomination for the election. The nominee must be at least 18 years old but does not have to be a Quelab member. Members can nominate themselves. Once a nominee confirms that they are interested they will have a chance to introduce themselves and communicate their interest to the members. Nominees will be encouraged to create a 3-minute or less YouTube video to introduce themselves as a candidate. Send nominations to secretary@quelab.net. Nominations will close on February 12, 2016. There is a minimum quorum requirement (52%), and we want to have everyone’s input, so please vote! You’re invited to our next community meeting and potluck on Sunday, December 6! Potluck at 4 PM, meeting at 5:05 PM. This meeting includes our annual strategic planning session where you can share your ideas for next year! Please join us, we would love to hear your ideas. 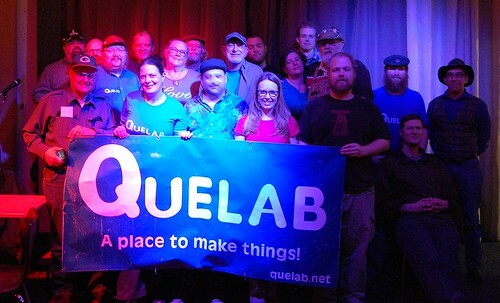 The focus of this meeting is what Quelab will be in 2016! It’s your chance to share your plans for what you want to make for your personal projects in the next year as well as what you want to make for Quelab! See an officer if you would like to add anything to the meeting agenda. All community meetings are open to members of the public. Please bring a potluck dish. You are welcome to stay for our hack night at 7 PM as well! We hope to see you there!